On your desk, it's about the size and thickness of a triple-decker Wonder bread sandwich. But the BassJump, an aluminum micro subwoofer to match your MacBook Pro, made me salivate more than soft, refined carbs covered in mayo ever did. It looks better than it tastes..err...sounds. 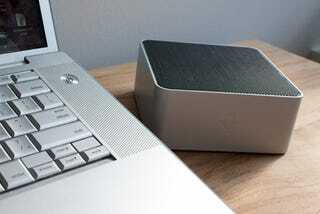 I can't deny, my MacBook Pro's tinny speakers have never sounded better than when complemented by the BassJump. Through USB (and some unobtrusive bundled software), the BassJump mixes with your existing laptop speakers to give you a more balanced audio experience. The tenor range, generally underrepresented by my MBP, is audible with the BassJump. The Beatles, especially, were hugely improved through the richer vocals and guitar riffs provided by the mini sub. Walking to the next room and closing my eyes, I decided my MacBook now sounded like a low-level iPod dock. Still, the audio isn't especially clear. And despite the BassJump's name, it doesn't really give you bass. It's more like a midrange speaker that's still incapable of bumping R&B.